Identification of Aeromonas, Furunculosis, & Vibrio in Aquariums & Ponds. Aeromonas and Vibrio (along with Aeromonas' cold water cousin Furunculosis) are anaerobic gram negative bacterium with similar manifestations such as infecting wounds, gastroenteritis, as well as being the primary bacterium cause of hemorrhagic septicemia. Other manifestations may include pop-eye and Dropsy. Aeromonas is more common in freshwater while Vibrio is more common in brackish and saltwater. Aeromonas salmonicida (commonly called Furunculosis ) is a variant of Aeromonas that is more common in coldwater, often affecting Koi and Trout. Aeromonas is the most common cause of Septicemia (which is more a symptom or condition than an actual disease), that often shows as red streaks in fins as well as more severe symptoms (often there is little that can be done at this point other than prevent other fish from severe Aeromonas/Septicemia infections). Since Aeromonas salmonicida most often has its root causes in water conditions, successful treatment nearly always requires addressing these issues. In fact I have witnessed many an aquarium where the same treatment regimen was followed from one tank to another, where one tank would fail while the other was successful; the only difference was correcting these issues before and while treating (see the Prevention Section for more). Please read further for more in depth descriptions and treatment/prevention methods for each. Vibrio is a lactose-fermenting, anaerobic, gram-negative bacteria. It is slightly curved and rod shaped, and is an opportunistic pathogen, found in saltwater/marine or brackish environments. This organism causes wound infections, gastroenteritis, and is a common cause of “hemorrhagic septicemia” (see the picture below in the Aeromonas section for Septicemia) where the microorganism enters the blood stream, resulting in septic shock, rapidly followed by death in many cases (about 50% of infections). 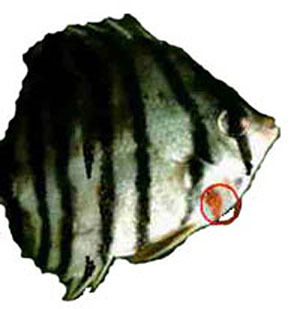 A common symptom in marine fish and brackish fish is red patches or red streaked fins, especially in Yellow Tangs and Marine Angels. Kanamycin can be effective in the high pH applications where Vibrio is usually present. Even better is a combination treatment of Kanamycin with Nitrofurazone found in AAP Spectrogram which is a much more synergistic/effective combination than treating separately with each product. Another older but useful antimicrobial for treatment of Vibrio is Triple Sulfa and it also is effective in high pH environments. Pimafix and a tea made Usnea Lichen are natural treatments that have shown some effectiveness for Vibrio, but is often a weak treatment at best so only mild cases should be treated this way. Treatment of wounds/sores (such as in in the fish pictured to the left) with AAP MethyBlu (Methylene Blue) or Hydrogen Peroxide in a 30 minute "Fish Bath" and/or a direct application MethyBlu or AAP Wound Control/Merbromin (best choice for direct application) is also useful in treatment of Vibrio. See our TREATMENTS SECTION for more. One of the most common infections in freshwater fish is caused by the rod-shaped bacteria Aeromonas, which is also a gram negative, facultatively anaerobic, lactose-fermenting bacterium. This bacterial pathogen is common in Goldfish, Ciclids and many other Tropical Fish. This bacterial infection can show itself in a wide variety of symptoms. Affected fish may have shallow or deep ulcers somewhere on the body, but may exhibit other signs such as exophthalmia (pop-eye), areas of bloody spots, and a distended abdomen. Infected fish with open sores appear to spread the disease to other fish, and sub clinical carriers may exist, shedding bacteria in their feces. Aeromonas infections are probably the most common bacterial disease to infect Tropical Freshwater Fish. Mortality rates are often low (10% or less) and losses may occur over a period of time (2 to 3 weeks or longer). In these instances, some factor; often water quality induced stress has caused the fish to become more susceptible to the bacteria. High amounts of organic decomposition (often in the gravel or filters). While water parameters, are the main trigger for an Aeromonas infection; diet, feeding procedures, and osmoregulation may allow for an Aeromonas Gut infection (or simply an unhealthy digestive system). These gut infections, which may or may not even include an actual Aeromonas infection may also mimic some internal parasitic infections. This determination may be difficult short of a necropsy (which means the dissection of a fish that died within a couple of hours). 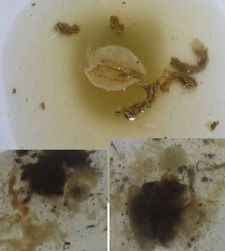 The picture to the right shows some feces that are a good (but not 100%) indicator of an unhealthy fish gut that may provide an opportunity for an Aeromonas infection. Generally the feces will also include some white slime, so this composite picture indicates an unhealthy gut which may be a precursor to an Aeromonas infection. It is also noteworthy that while water quality is the more common cause of Aeromonas infections, gut infections can happen in aquariums with otherwise healthy water conditions. Sometimes soaking fish food for 5 minutes may prevent these infections (especially for goldfish). Feed a fish food high in fiber. The vast majority of fish foods (including the many premium brands such as Northfin) are very short in the amount of fiber needed which should be at least 18-19%, NOT the 5% so common to most fish foods. Be careful of live fish food sources that may carry in Aeromonas or other bacterial heterotrophs. A good example are earthworms, which although an otherwise very nutritional fish food source, the soil in their digestive system is often LOADED with heterotrophic bacteria!! Follow procedures for optimal Redox Balance and fish osmoregulation which includes mineral Cations. It is noteworthy that acidic environments or diets can lower Redox reduction and has the possibility to slow osmoreglation as a result. Back to water quality as a determining factor: Water quality, high amounts of organic decomposition, and low oxygen levels are major distinguishers between Aeromonas and the often confused with bacterial disease "Columnaris". In my experience, with Aeromonas infections, decaying organics or many of the above noted water quality stressers are present often along with low oxygen levels and a Redox that is too low while Columnaris is often found in more well kept aquariums/ponds with stressers such as aggressive fish or too high Redox. It should be also noted that since Aeromonas is facultatively anaerobic (aerobic respiration is advantageous, but not necessary), so improving oxygen levels and circulation is often important for prevention and recovery. While Aeromonas can and does thrive in oxygen rich environments (in a test tube environment), in practical experience this anaerobic bacterium does not compete in aquariums or ponds with optimum parameters. What is also noteworthy from my many years of experience with 1000s of clients over these years is that aquarium, bowls without any established bio filter have a VASTLY higher incidence of Aeromonas infections, whether internal or external or both. Even a small tank such as a 2 gallon aquarium should really have an established bio filter such as a high bio capacity AAP Hydro Sponge Filter, otherwise often even the best of treatment regimens may fail once an Aeromonas infections gets started. Septicemia of the blood resulting in red streaks, sometimes incorrectly diagnosed as a disease unto itself (AKA Red Pest), when in fact it is a symptom. Sometimes Aeromonas can present as an aggressive case of fin rot that often spreads beyond the outer finnage (psuedomonas is the more common cause of Fin Rot). Aeromonas (along with Vibrio in brackish and marine) are common causes of hemorrhagic septicemia. Note; Septicemia is often incorrectly identified as a disease of its own and called "Red Pest", however it is not rather a symptom or condition. Septicemia happens whereby the microorganism enters the blood stream, resulting in septic shock, rapidly followed by death in many cases. Clinical signs of Aeromonas septicemia range from mild symptoms of red streaks to more serious symptoms such as sudden death with high morbidity in peracute cases to superficial to deep skin lesions. Skin lesions include variously sized areas of hemorrhage and necrosis and the base of the fins. These lesions may progress to reddish to gray ulcerations with necrosis of the underlying musculature. Ulcers may be observed in conjunction with a hemorrhagic septicemia which can produce non-specific lesions and clinical signs of exophthalmos (Abnormal protrusion of the eyeball), ascites (An abnormal accumulation of serious fluid in the abdominal cavity), and visceral petechiation (Small red or purple spots on the body), and a hemorrhagic and swollen lower intestine and vent. Anorexia and skin discoloration are also observed with the septicemia. Unfortunately once septicemia is widespread within the fish in question, usually the prognosis is very poor regardless of that the aquarium keeper does both medicinally and improvement of water conditions. When Septicemia is present, Tetracycline products including Minocycline (Maracyn 2) should NOT be used as these can exasperate the problem by lowering red blood cell count. 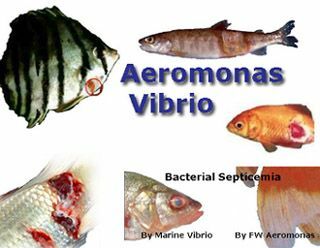 As noted earlier, Aeromonas (along with Pseudomonas Bacteria which is also gram negative but is aerobic) is one of the more common causes of bacterial “pop-eye” in fish. A recent university study dealing with Trout found that removing stressors (including oxidative stress) and improving oxygen levels often cleared eye infections without medication. Although sometimes direct medication applications such as Silver Nitrate/Potassium Dichromate (1st choice), Merbromin (2nd choice), OR Potassium Permanganate (3rd choice) and hospital tank treatment with Erythromycin or a Kanamycin/Nitrofurazone is necessary. Even though Pop-Eye is a symptom of more than one possible cause (such as Aeromonas), one thing that is common to this malady is fluid build up behind the eye. So improving osmotic function (as in Dropsy) with correct mineralization is important (as noted later in the prevention section), as well medicated baths, swabs, or dips are often useful in curing/treating this condition. I often find a dip to work better than a bath for a severe stubborn case of Pop-Eye where the causes have been eliminated, yet the fluid remains. Aeromonas can also be a factor in swim bladder or intestinal problems, especially when food is allowed to decompose on the bottom of the aquarium where fish (especially goldfish) may come along and consume it; also soaking dry foods in water prior to feeding cuts down on intestinal Aeromonas infections (as does healthy water parameters). Large amounts of decomposing organic debris on the bottom of the aquarium (especially with goldfish) can also be a cause intestinal Aeromonas infections, so good filtration and in between cleanings with tools such as the Eheim Sludge Remover Vacuum can help. As noted earlier in the Aeromonas Overview Section (other considerations), gut or digestive issues may not even start with Aeromonas or even be caused by poor water conditions & poor fish osmoregulation, but can these conditions can provide fertile grounds for an Aeromonas infection to take hold. With some cases of bloating (such as the picture to the right) the cause is most likely osmoregulation resulting in fluid buildup. Unfortunately, once it gets to this point, it is often not treatable, although a medicated fish bath with sodium chloride, Epsom salts, & Methylene Blue may help. However prevention is much easier, including proper mineralization (which includes a balanced Redox) a good diet with adequate fiber content (most fish food are NOT adequate in fiber content). It is also noteworthy that swim bladder & bloating problems are a syndrome, NOT a disease per say as there are many causes or combinations there of including Aeromonas bacteria and feeding low fiber diets. With Bettas, poor water conditions due to ammonia spikes and other water quality issues can be a cause of swim bladder Aeromonas infections. Since many bettas are not kept in filtered containers, I strongly recommend finding some way to either add a good bio filter (such as AAP Hydro Sponge #1) or adding products such as Matrix to the bowl bottom or better in a small flow through medicine bottle (AmmoChips and other similar products can be used, but these are not as effective long term for these ammonia spikes). Generally for Swim Bladder infections simple fish baths described later in this article should be the first treatment step as well as withholding food for a couple days, and increasing mineral/electrolyte levels in the tank. This can be done with products such as Regular or Medicated Wonder Shells and/or AAP Betta Spa which both are also especially helpful for fish such as Bettas not kept in filtered aquariums. Betta Spa is somewhat weak when it comes to essential mineral Cations, but includes Indian Almond Leaf Extract which can be very beneficial for bloating caused by Aeromonas (AAP Wonder Shells at 1/4 dose along with Betta Spa is an excellent combination). Another simple remedy for swim bladder or other bloating issues is a thawed and shelled frozen pea fed to the fish. While this is more for constipation, if constipation is at the root or even just a part of the problem, this can help as can feeding frozen, live, or even FD Brine Shrimp. A fish food with a high amount of pea flour is also a plus, at the very least for prevention. In part because pea flour improves fiber while limiting protein which in 99% of commercial fish foods are MUCH too low in fiber (including most so-called premium brands such as NLS or Northfin). More bluntly, a low fiber fish feeding diet is one of the main causes bloating in fish, so switching diets is at the very least a preventative that should be followed!! When Aeromonas goes systemic (internal) it has been shown to be a major contributor to Dropsy (which is a kind of catch all diagnosis for bloating with distended scales usually caused by kidney and sometimes liver maladies). Soak dry foods so as to not introduce air into the intestines which can start an Aeromonas infection in the intestines (gut) and swim bladder. Use antibiotics sparingly, many have side affects on the liver and kidneys such as Neomycin and Tetracycline. Kanamycin (which is gram negative) is a better choice, although Neomycin when fed as a part of a medicated food can be useful. Please see this more in depth article (from Aquarium Answers) about Dropsy: "Aquarium Answers; Dropsy in Fish"
Pimafix AND Melafix (combined) but only for VERY MILD infections, especially mild wound infections (Melafix by itself is rarely effective on Aeromonas though since it is gram positive). Nitrofurazone for more serious infections, which SHOULD be combined with Kanamycin for an even stronger combination treatment is generally my recommended default staring place for in tank or hospital tank treatment. Best to use an already combined product such as AAP Spectrogram being a more synergistic combination of Kanamycin/Nitrofurazone and is easier to use and pharmaceutical grade too. Neomycin is an excellent antibiotic when mixed with food that delivers medications internally to infections (although this is primarily a gram positive antibiotic, it is anaerobic in activity and it should be combined with a gram negative antibiotic such as Kanamycin for better results). Triple Sulfa is also a medication worth considering, especially in cases of Septicemia (caused by Aeromonas or other pathogens). Although not the strongest medication for serious cases of Aeromonas, Triple Sulfa is often effective for the red streaks found in fins even though the fish may be healing otherwise. A Triple Sulfa treatment for red streaks is often boosted with the addition of a medicated bath using Methylene Blue and salt with direct application of Methylene Blue to the affected area immediately prior to the bath. When Aeromonas is the primary cause of fin & tail rot, your best choice is AAP Bettamax. This is a synergistic combination of Nitrofurazone, Sulfas and more. This is an especially good choice for long finned fish such as Bettas or guppies. Another possible choice for Aeromonas that presents as fin & tail rot is AAP Maracyn Plus which is a synergistic combination of Sulfamethazine & Trimethoprim and can be an effective treatment. 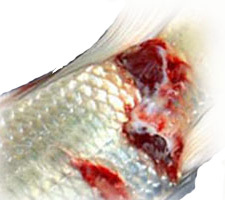 HOWEVER, do NOT use use if fish have large wounds or are suffering from septicemia as Trimethoprim can lower blood platelets and use can be fatal in fish already suffering from such issues. Another antibiotic that may be worth considering for some Amazon River tanks is Minocycline (Link) which is found in Maracyn Two. Do not confuse this with Maracyn One which contains Erythromycin Sulfate which is rarely effective for Aeromonas although Erythromycin Phosphate which is ONLY found in AAP Myacin (LINK) is more effective. Tetracycline Hydrochloride is another maybe choice. This said, both being Tetracyclines, these can have many drawbacks for many aquarium applications (including being less effective with gram negative bacterium) and should only used in rare instances (please follow the previously noted link for further information). Aquarium Salt or AAP Cichlid Salt can also be added at a rate of 1 tablespoon per 5 net gallons of water as an additional treatment to those above and the baths below (for livebearers, brackish, puffer, etc. a good marine salt is suggested). However sodium chloride rarely replaces these treatments, only compliments. For ulcerations/sores (which are quite common with Aeromonas), I often recommend a direct swab with Merbromin (AAP Aquarium Wound Control). I also recommend medicated baths of about 30 minutes using either Methylene Blue at double normal in tank strength using tank water for this bath, then disposing of the bath water after completion. Methylene Blue used in a bath is often a good choice for internal manifestations of this bacterial pathogen such as Swim Bladder, intestinal, Dropsy or Pop-Eye due to its effectiveness in tissue penetration. 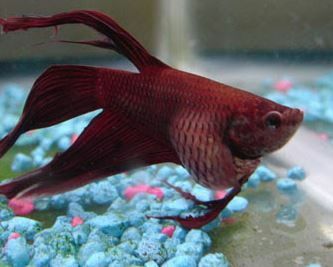 In fact in Swim Bladder and intestinal Aeromonas infection, the MB Bath (along with possibly 1-2 teaspoons of salt and ¼ teaspoon of Epsom salt per gallon of bath water) followed by changes in water in the main aquarium, changing diet and/or withholding food for 2 days (dry foods should be soaked for 5 minutes prior to feeding), establishing a GH level of at least 100 ppm (for positive Calcium, Magnesium mineral ions) and 1 tablespoon of salt per 5 gallons may be all that is necessary for treatment. If this does not remedy the problem then treatment with medications such as Kanamycin, Metronidazole, or Neomycin in a fish food soak. My preference for intestinal infections would be a combination of Metronidazole and Neomycin in this fish food soak (these can also be used in the bath, but are not as effective in reaching the source of the infection as fish food delivery). If just one fish is infected, treating in a hospital tank that has an established bio filter often is best, but since Aeromonas often has its root causes in water parameters, these MUST be addressed regardless of where the fish is treated. Please read the "Prevention" Section for more. As noted earlier in the section dealing with Dropsy, water parameters, filtration and more is important for prevention AND ongoing treatment. My extensive experience in dealing with clients/customers fish that have likely Aeromonas infections (both in person and elsewhere) have shown that often all the medications in the world will NOT work if your do not get your water in check, which not only includes the water column, but what is hidden in substrate, filters, decor, etc.! Good tank parameters including 0 ammonia/nitrites, low nitrates, and a stable pH/KH. Lower pH water can increase the virulence of Aeromonas, so low pH tanks tend to be more problematic to Aeromonas infections. Low amounts of DOC (dissolved organic compounds), large amounts of organic mulm/decomposition which will often show up as an unstable pH and KH as well as occasionally high nitrates. Check your substrate for rotting organic debris or for compaction (a sign of rotting organic debris). Check in pockets where debris accumulates in filters or in/around aquarium decor, rocks, etc. Aeromonas infections occur most often during environmental changes, stressors, changes in temperature, in contaminated environments, and when an organism is already infected with a virus or another bacterium. Aeromonas can also be ingested through food products contaminated with the Aeromonas bacterium. For this reason be careful to clean up uneaten food and to remove food that may get trapped in filters. As well, if the fish food method of aquarium cycling is used, it is best to dissolve it as a fine powder into water first before adding to the aquarium. Use of products such as Pillow Moss which are a natural way to maintain low pH soft water tank while not allowing Aeromonas infections. Limit use of Activated Carbon. This is a double edged sword as activated carbon can help lower DOC, however it also can lower dissolved oxygen and provide an ideal surface area for anaerobic Aeromonas bacterial growth. Good filtration that is regularly and properly cleaned (rinsed with de-chlorinated water, not straight tap water). Good circulation which includes a dissolved oxygen 5-7 ppm since Aeromonas is an anaerobic bacteria when usually an aquarium fish pathogen (it thrives in LOW oxygen water). If you do not have this often difficult to find test kit, simply maintaining a combined aquarium water turnover of 5 times the aquarium size per hour. This counts all circulation devices such as air stones. Proper mineralization is important for correct osmoregulation which in turn allows for better oxygen permeation (which recent studies show is important to fish eye infections). This is where the use of products such as AAP Wonder Shells are helpful. Unhealthy Aquarium Redox (& rH); while I often discuss the fact that many aquarium keepers miss the importance of Redox Reducers so as to lower free radicals and for improved osmoregulation, a Redox that is too low or at least needs to be temporarily raised can help with Aeromonas and Vibrio bacterial infections. Redox Oxidation can be improved with simply increasing the circulation and oxygen content or for more drastic measures adding Potassium Permanganate can increase your aquarium or ponds Redox oxidation properties quite quickly. In Coldwater freshwater fish the similar pathogen is Aeromonas salmonicida also known as furunculosis. Treatment in Coldwater can be difficult as many treatments are not as effective below 65 degrees F.
Also Nitrofurazone, which is one of the treatments of choice in coldwater is less effective at the higher pH most coldwater fish prefer. In higher pH applications (8.0 + in particular), Triple Sulfa and Kanamycin are generally the better choice. And on some strains of Furunculosis, Tetracycline has shown occasional effectiveness. Another treatment in coldwater is Doxycyline (or Oxytetracycline/Doxycycline soaked in the food, which is especially useful when treating the water such as in a pond is undesirable). A newer treatment preferred by many Koi keepers is KoiZyme (formally known as LymnoZyme). This is a formula of natural bacteria, enzymes, and micro nutrients that reduce the Aeromonas (and Pseudomonas) bacteria present in the water. It does not attack the bacteria directly, rather is out competes the Aeromonas bacteria for nutrients. Pimafix often combined with Melafix is an organic treatment shown to be effective for Aeromonas, especially in pond applications. Treatment of wounds with Mebromin or a 30 minute double dose dip with Methylene Blue is also useful in treatment of Aeromonas. It is important to note that both Aeromonas and Vibrio pathogens are opportunistic bacteria that are more virulent in poor water conditions. It is important to affect a cure that water conditions are improved during treatment and not worsened by the treatment itself, which is why I do not recommend Tetracycline be used in display tank treatments of this disease as Tetracycline lowers red blood cell counts and binds calcium in the water which is essential for healing. Regular partial water changes between treatments, stable pH and a proper functioning bio filter are all essential for effective cure and prevention. I recommend good water parameters as prevention and to speed recovery during infections. This can be saved to your iBooks, computer, printed for easy reading Computer, etc.